Composites Part A: Applied Science and Manufacturing publishes original research papers, review articles, case studies, short communications and letters from a wide variety of sources dealing with all aspects of the science and technology of composite materials, including fibrous and particulate reinforcements in polymeric, metallic and ceramic matrices, and 'natural' composites such as wood and biological materials. 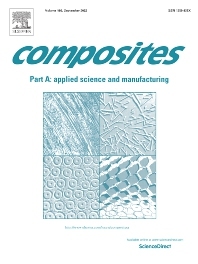 The range of applicable topics includes the properties, design and manufacture of reinforcing fibers and particles, novel architectures and concepts, multifunctional composites, advances in fabrication and processing of composite materials and structures, manufacturing science, process modelling, experimental mechanics, microstructural characterization of composites and their constituent phases, interfaces in composites, new approaches to prediction and measurement of mechanical, physical and chemical behaviour, and performance of composites in service. Articles are also welcomed on economic and commercial aspects of the applications of composites, design with composites and case studies. All articles are subject to rigorous peer review to ensure they make an important and novel contribution, and a high standard is set for both content and presentation. The Editors aim to conduct the review procedure with the minimum of delay so that prompt publication ensues.